I seem to be getting later every week with my Friday Fictioneers contribution. I almost left it until tomorrow, but decided against the idea. So, here it is. The challenge is hosted by Rochelle Wisoff Fields and is open to anyone who would like to join in. Just follow the link above for details. The challenge involves writing a story in no more than 100 words from the photo prompt provided by Rochelle. Sounds of shattering glass disturb my troubled sleep. Silvery-red shards shoot across the confined space, shimmering in the glow from the neon light in the street beyond. Sharp spikes strike my face and arms, piercing my exposed skin. I scream and cover my face as specks of blood pattern my arms. Not my eyes! Leave me my eyes! I struggle to understand why I suffer thus, and in the silence, I waken. It reminded me in a way of my dad, how he would tremble under the covers when hit with a bout of malaria….left over from WWII. I didn’t see all the flashbacks he had. I was too little to realize what was going on. I imagine that flashbacks can be quite frightening – and malaria is a dreadful disease anyway. I hope he recovered well. Thank you for sharing that, Betty. I have been waiting for you to submit your story to FFforAW. Is everything okay? I’m looking forward to reading your story! Please don’t feel like you have to submit one though because I know you have been extremely busy! I’d like very much to participate in this. It’s just that this week’s been a week for several ‘other’ types of posts for me to do besides flash fiction. I always try to cover traditions – and since last Saturday we’ve has Valentine’s Day and Pancake Day very close together this year. Then I had that Love in Four Words post to do. Then, lo and behold, I suddenly realised that yesterday was the first day of my ‘5 free days’ on Amazon: another post. I’d had it in mind that it wasn’t until next Tuesday. And I just had to do the Friday Fictioneers while it was in my head. All-in-all, a lot more posts than I can really fit in. Anyway, I ‘m almost done for this week. I might even manage to write some of my book tomorrow. I’m not moaning really. I love doing these posts. I am sorry that you are feeling a bit overwhelmed. I know that feeling and it isn’t pleasant. I am going to remind you of the advice you gave me. 😀 My feelings won’t be hurt if you choose not to post a story on FFfAW because I completely understand. I know you will post one when you have more time. I do understand. For a minute I thought it was going to be a torture in the mind of the narrator, but it harkened back to a real incident. It is always a great surprise to read the final line in your Friday fiction. It often changes everything! Great work, and entertaining. I am hopeless at flash fiction. Too verbose!!!! I will check out priceless joy. You will do a great job of being a mentor!!!! Millie, that was excellent – chilling, but realistic. I could “almost” feel those shards in my body and my eyes. Oh! That is why so many people were writing about crystals. I have never seen crystals grown before. I thought they were pieces of metal. You can grow crystals from all sorts of chemicals – like copper sulphate (blue crystals). We usually do those and salt crystals at school. Very pretty they are. The ones in the prompt are possibly something like magnesium sulphate – which are sort of silvery-white. I think the red colouring is just from the background, but it’s hard to tell. They can all grow quite long if left long enough. I wish we would have done that when I was in school, but we didn’t. Sounds very interesting to see grow. Thank you, Tracy. I wouldn’t want to experience it either! I definitely agree with the ‘Ouch’! Very imaginative . I can actually picture those words and scenes in front my eyes , quite edgy and very beautiful . Glad to have found your blog . the way you told it i could sense the sight and sound of shattering glass and the terror that followed it. well done. I bet accidents do make you feel disoriented about time and space. Luckily, I’ve never had to endure that. I sense it’s a car accident, but what it is doesn’t really matter. I got the emotion beyond what happened and a real sense of the trauma. Well done, Millie. It’s so great to see you doing these. I’m so sorry to hear about your husband having an accident and being partially disable. Oh, that’s terrible. Glass has that effect, I think. It is worrisome, especially around the eyes. It seems to cause such permanent damage. Oh, it all sounds so painful. It’s wonderful to hear his mental faculties are still in check. I’ve had a few scares on the road. Accidents happen so fast. I guess we just thank our lucky stars today, Millie. That said, your husband is lucky, too. It could have been so much worse. This is quite tense at first. I’m really with the narrator when she fears for her eyes. I like the subtle hint in the beginning – troubled sleep – that it’s a memory rather than happening at that moment. Great stuff! Very good, using the present tense was definitely the right choice here. It made it all more “immediate” in my mind. Terrifying! Definitely some ambiguity here–I wonder why this attack occurred! Nice work. I, too, thought of torture which always makes my skin crawl – in a good way if done well – so was surprised by your ending – in a good way. I’m not sure at this point if this is a flashback of a car accident or the accident as it’s happening. It’s graphic and vivid nonetheless. I also found myself hoping her eyes were spared. There’s nothing wrong with leaving the reader with a question, Millie. It’s challenging to cover everything in a hundred words. Good work. Those pointy bits in the picture do bring thoughts of a traumatic event. 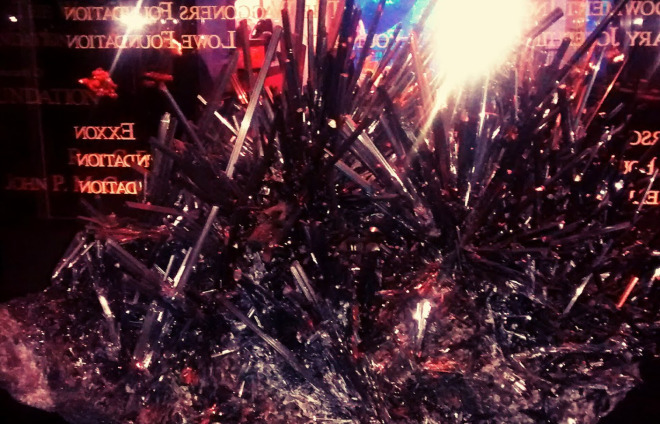 Those shards remind me of The Iron Throne of GOT… I guess it’s a sign for me to begin ASOIAF’s re-read… lol!